This book introduces a brand new field of scientific research based upon analysis of artifacts retrieved from crashed and damaged UFOs that have come down in Russia and America. For the first time, it reveals the scientific principles behind UFO propulsion dynamics, and shows that these principles are known and recognized by today’s physicists. Potter’s analyses of these UFO mechanisms are substantiated with references to a broad array of over 300 research papers published in scientific journals! Potter correlates many of the phenomena observed firsthand by close encounter witnesses and abductees and pinpoints the common themes reported, categorizing them according to known physical principles. He produces a comprehensive orchestration of energy dynamics used inside and around UFOs. His precise and lavish illustrations allow the reader to enter directly into the realm of the advanced technological engineer and to understand, quite straightforwardly, the aliens’ methods of energy manipulation: their methods of electrical power generation; how they purposely designed their craft to employ the kinds of energy dynamics that are exclusive to space (discoverable in our astrophysics) in order that their craft may generate both attractive and repulsive gravitational forces; their control over the mass-density matrix surrounding their craft enabling them to alter their physical dimensions and even manufacture their own frame of reference in respect to time. Includes a 16-page color insert. An updated reprint of Gravitational Manipulation of Domed Craft. An amazing book with tons of technical illustrations! 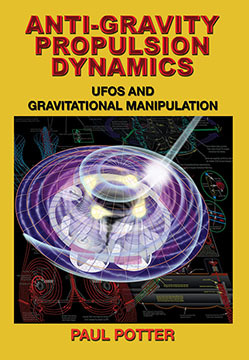 ANTI-GRAVITY PROPULSION DYNAMICS: UFOs and Gravitational Manipulation, New Edition By Paul E. Potter 560 pages. 8x10 Paperback. Illustrated. References.